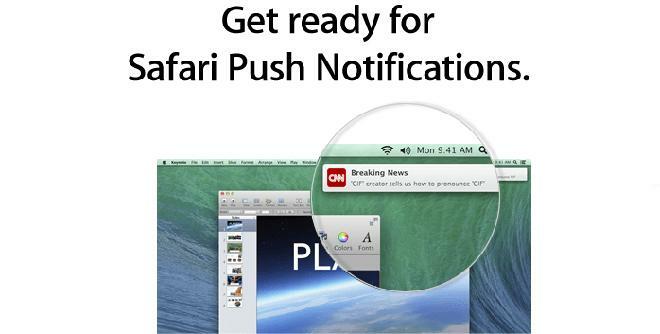 The email shortly summarizes the Apple Push Notifications Service, which developers can use to send notifications to website users via Safari in OS X Mavericks. A picture of the implementation, seen above, was included in Wednesday's email and also shows up on Apple's Developer webpage. Safari's push notification service is one of the many additions Mavericks will bring to OS X. Apple notes the service will work in much the same way as app notifications, pointing out that pop-up message boxes will include a website's icon, text and webpage link. In addition, users will be able to receive messages even when Safari isn't running. As of now, notifications in OS X are limited to apps, accessible from Mountain Lion's Notification Center. Mavericks will for the first time bring Web-based notifications to Apple's desktop OS. Developers are asked to visit the Safari Push Notifications webpage on Apple's Developer Center portal for further information on how to start implementing the service into their websites. Currently being seeded to developers in beta form as Developer Previews, OS X 10.9 Mavericks is slated to launch sometime this fall along with a maintenance update for Mountain Lion.